Searching for an ISO 9001 customer satisfaction survey with a high response rate? If your business is aiming to qualify for ISO 9001, you will need to be able to understand and demonstrate that you’ve sourced feedback from your customers on a regular basis, in a trackable way. Of a total of 11 722 respondents to the user survey, 4 222 cited customer satisfaction as the key influencing factor behind certification, ahead of 3689 indicating “market need”, while 5 886 saw it as the primary benefit, with the value of “standard business processes” in close second place. So it’s clear that the processes encouraged by the ISO 9001 certification do help to enhance customer satisfaction. 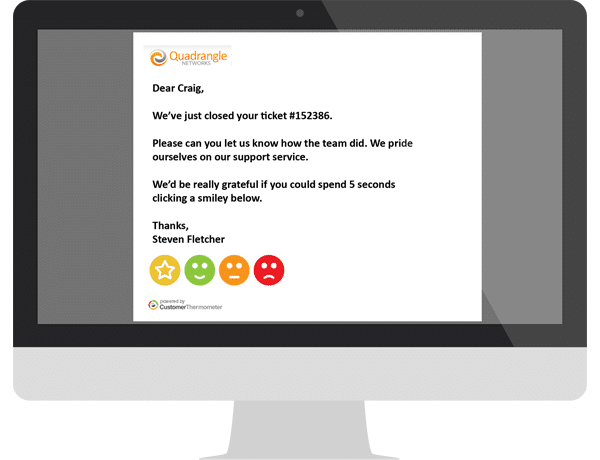 The issue in gathering regular, actionable and trackable customer feedback is that long-format surveys are often not ideally suited. Customers are frequently too busy to fill in a long survey and so getting to the critical mass of feedback required by ISO 9001 isn’t straightforward. Many companies are switching to Customer Thermometer. It reduces the burden on customers’ time, and makes tracking which customer said what a breeze. One such company, MHE Demag engineers, manufactures and services material handling products including cranes, hoists, explosion-proof lifting equipment, warehouse trucks, dock levelers, rail systems, car park systems, electrification systems and building maintenance units.